An unacknowledged key feature of East Asian FTA diplomacy is the region's active cross-regional preferential trading relations. In sharp contrast to the Americas and Europe, where cross-regional initiatives gained strength after the consolidation of regional trade integration, East Asian governments negotiate trade deals with partners outside of their region at an early stage in their FTA policies. 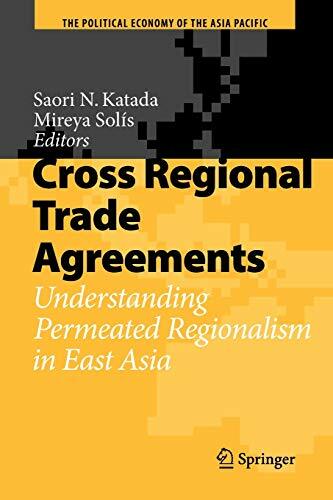 The book asks three main questions: Are there regional factors in East Asia encouraging countries to explore cross-regionalism early on? What are the most important criteria behind the cross-regional partner selection? How do cross-regional FTSs (CRTAs) influence their intra-regional trade initiatives? Through detailed country case studies from China, Japan, South Korea, Singapore, Thailand and Malaysia, we show the ways in which these governments seek to leverage their CRTAs in the pursuit of intra-regional trade integration objectives, a process that yields a much more permeated regionalism.